Movement to contact (MTC) is an offensive operation conducted to develop the situation and to gain or maintain contact. A properly executed movement to contact allows the commander to make initial contact with minimum forces. At a minimum, a movement to contact consists of a security element (advance and rear guard) and the main body. Depending on METT-T, company commanders may place additional security with each column or element and may use flank and rear security to screen the main body. Attacks are offensive operations of coordinated movement that are supported by fire and are conducted to seize or secure terrain or to defeat, destroy, or capture the enemy. Movement, supported by fires, characterizes the conduct of an attack. However, based on his analysis of the factors of METT-TC, the commander may decide to conduct an attack using only fires. An attack differs from a MTC because enemy main body dispositions are at least partially known, which allows the commander to achieve greater synchronization. This enables him to mass the effects of the attacking force's combat power more effectively in an attack than in a MTC. Hasty attacks seek to take advantage of the enemy’s lack of preparedness by using boldness, surprise, and speed to achieve success with the forces immediately at hand and with minimal time devoted to preparation. Usually conducted as means of exploiting an opportunity, hasty attacks require only minimum coordination with higher and adjacent commanders. Deliberate attacks normally occur due to the enemy’s preparedness to receive an assault. Therefore, deliberate attacks involve detailed reconnaissance to pinpoint objectives, enemy positions, and obstacles in order to determine potential vulnerabilities and appropriate supporting positions to exploit them. Commanders designate main and supporting efforts and a reserve, as appropriate. Breaching, supporting, and assaulting tasks are resourced; the direct and indirect fire support plans, to include CAS, are integrated into the scheme of maneuver; and control measures and triggers are emplaced accordingly. Finally, commanders develop plans for consolidation, reorganization, avoidance of the culminating point, and exploitation. Spoiling attacks are limited objective attacks used to delay, disrupt, or destroy the enemy’s ability to attack. Spoiling attacks normally occur within the defense, though they may also occur to stop the enemy’s offensive action prior to launching a larger friendly attack. Commanders produce these effects by striking the enemy during vulnerable moments in their preparations, such as in their assembly areas (AAs) or attack positions or while they are on the move. Spoiling attacks may be either hasty or deliberate and their conduct is similar to other types of attacks. A counterattack is an offensive action conducted by the defense to regain the initiative or to deny success of an enemy attack. Similar to the use of a reserve, preplanned counterattacks integrated into the defensive plan are preferred to improvised counterattacks that risk reinforcing failure. Commanders conduct counterattacks either with a reserve or with lightly committed forward elements. Execution of the counterattack occurs after the enemy launches its attack, reveals its main effort, or creates an assailable flank. Feints are limited scope attacks with an extremely specific objective intended to cause the enemy to either react in a particular way or delay or disrupt reaction, such as by repositioning forces, committing reserves, or shifting fires. When they reinforce the enemy’s expectations. When the attack appears to present a definite threat to the enemy. When the enemy demonstrates consistent early committal of their reserve. When the attacker has several feasible COAs, any of which the enemy could confuse for the main effort. A raid is a limited objective attack involving swift penetration into a hostile area and a planned withdrawal upon completion of the mission; the planned withdrawal separates raids from other types of attack. Raids may occur in permissive and uncertain/hostile environments. Raids occur in daylight or in darkness and both within or beyond the scope of supporting friendly units or supporting arms. When a raid occurs beyond the reasonable support of a parent unit, the raid force is an independent unit for the duration of the raid and receives resources accordingly. Raid forces receive specific objectives to focus their efforts and assist in decision criteria. The primary differences between the raid as a type of attack and as a type of patrol (Combat Patrol) are size and scope. The raid force should withdraw using a different route from that used to approach the objective. Capturing or destroying C2 locations. Destroying logistics, caches, and other means of support. Obtaining information concerning enemy locations, dispositions, strength, intentions, and methods of operation. Confusing the enemy and disrupting his plans. Movement to the objective area. Withdrawal from the objective area. An ambush is a surprise attack from concealed positions designed to reduce the overall combat effectiveness of an enemy force, capture or harass a threat, and to destroy or capture equipment or supplies. Imagination, need, and the infantry unit’s abilities and capabilities are the only limitations on the types, methods, and purposes of ambushes. Point ambush, when the ambush force deploys to attack the enemy in a single kill zone. Area ambush, when the ambush force deploys to conduct several point ambushes throughout an area. The ambush force is normally task-organized into assault, support, and security elements. The assault element executes the ambush. The support element fixes the enemy with direct fires; provides additional personnel for tasks, such as litter bearers and detainee handlers; and may be responsible for controlling supporting arms. The security element secures the objective rally point, provides protection and early warning to the assault element, and isolates the ambush site. Tactical movement to the objective rally point. Reconnaissance of the ambush site. Establishment of ambush site security. Preparation of the ambush site. Similar to a feint, the demonstration is an attack designed to deceive the enemy about the location of the main attack; however, the friendly force does not make contact with the enemy. Demonstrations may be an economy of force measure. Exploitation is an offensive action applicable across all of the operational areas within a range of military operations. Once the enemy is disorganized in depth following a successful offensive action, exploitation multiplies the initial success by destroying vulnerable assets and resources, preventing the enemy from successfully disengaging and re-establishing other means of resistance. Exploitation helps to maintain dominance of tempo by exposing further opportunities for exploitation. Initiative, boldness, and the unhesitating employment of uncommitted forces characterize exploitation, which can occur physically or through measures such as IO. In the hasty attack, the force in contact normally continues the attack, transitioning to exploitation. In the deliberate attack, the defense, or stability operations, the commander’s principal tool for exploitation is normally the reserve, appropriately constituted to execute the decisive action of the mission (such as combat forces, engineering assets, CMO or IO, or various combinations thereof). Commanders retain only those reserves necessary to ensure flexibility, continue momentum, and react to likely enemy responses to the exploitation. The reserve is positioned where it can exploit the success of the main or supporting effort(s). Exploitation forces execute bold, aggressive, and rapid operations using the commander’s intent and mission tactics. CS and CSS units deep in the enemy’s rear. A pursuit is an offensive operation designed to catch or cut off a hostile force attempting to escape, with the aim of destroying it. When the enemy’s ability to resist is broken and he attempts to escape, friendly forces shift to the pursuit. The difference between exploitation and a pursuit is the condition of the enemy. The object of a pursuit is to destroy the enemy force or the ability of the enemy to affect security, the local populace, or civic government and processes. Like exploitation, pursuit requires broad, decentralized control and rapid movement. Commanders may use organic and nonorganic assets to maintain observation on the enemy. Maximum use of C2 and observation assets maintains momentum. Friendly forces task-organize themselves into a direct pressure force and an encircling force. When necessary, a direct pressure force alone can conduct a pursuit, but the preferred method is to apply both direct pressure and encirclement to ensure defeat of the enemy. Maneuver places the enemy at a disadvantage through the application of lethal and nonlethal fires and movement. Doctrinally, when conducting offensive action, the Marine Corps organizes the battlespace into deep, close, and rear areas. The infantry company can expect to operate within these areas as part of a larger force and will likely receive an AO, axis of advance, route of attack, or similar control measure with which to define the company’s portion of the battlefield. Conducting offensive action normally imposes multiple tasks on the commander. Such tasks may come in the form of phases, conditions, or elements that are particular to any type of attack or form of offensive maneuver. These requirements directly affect the manner in which the commander divides the available combat power and resources in organizing for the offense. Normally the combat power is organized into the main and supporting efforts and the reserve. Commanders weight the main effort to ensure success at the decisive point, which often means that the main effort contains the greatest concentration of combat power. The purpose of the main effort is to accomplish the mission; the designation of main effort allows to focus all of the unit's energies, actions, and resources toward enabling the main effort to achieve success. For example, in conducting an attack on a strong point, the commander is likely to task the main effort with the duties associated with the assault element. Supporting efforts enable the main effort to achieve success at the decisive point. 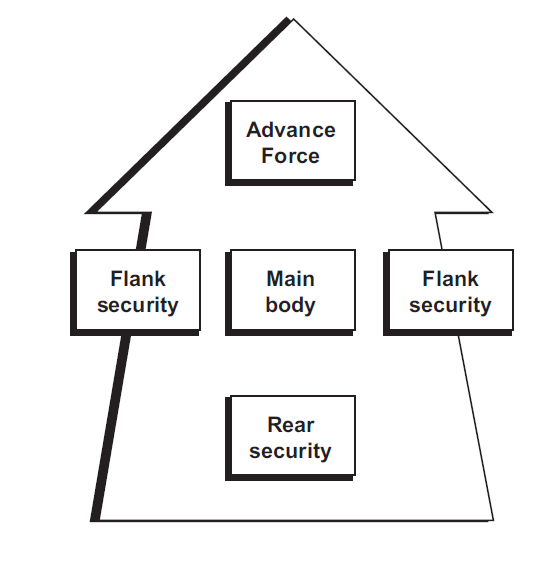 For example, in conducting an attack on a strong point, the commander is likely to task the supporting effort with the duties associated with the breach element. The mission assigned to supporting effort must directly support the main effort's purpose. Allow the main effort to maneuver to the decisive point. Prevent the enemy from reacting to the assault. Cause the enemy to dissipate his fire support or prematurely commit his reserves. Prevent the enemy from surprising the main effort. The primary mission of the reserve is to conduct decisive movement, take advantage of sudden opportunities, and reinforce and exploit main effort success. Employment of the reserve at the decisive moment is the commanders’ principal means to influence the action. A reserve does not reinforce failure. The reserve must be large enough to exploit success, yet its size should not materially weaken the main effort. There are six forms of maneuver—frontal attack, flank attack, envelopment, turning movement, infiltration, and penetration. Frontal attack is a form of maneuver in which an attacking force seeks to destroy a weaker enemy force or fix a larger enemy force along a broad front by the most direct route. It is generally the least desirable form of maneuver because it exposes the attacker to the concentrated fire of the defender and limits the effectiveness of the attacker's own fire. When conducting a frontal attack, the commander must maximize the use of combined arms assets to mitigate the vulnerability of the force. The frontal attack is often the best form of maneuver for an attack in which speed and simplicity are the key; it is useful in overwhelming weaker defenses, securing outposts, or disorganizing enemy forces. A flank is the right or left side of any military formation and is generally weaker in terms of combat power than the front of the formation. Therefore, a flanking attack is a form of offensive maneuver directed at either flank of an enemy force. It is different from envelopment in that envelopment directs its attack beyond the flank and toward the rear of the enemy. 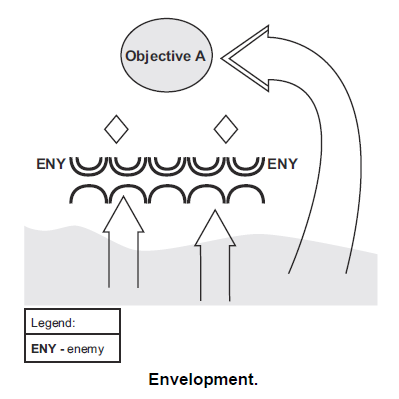 Moreover, both flank attacks and envelopment are different from turning movement in that, while a turning movement seeks to force the enemy to move, flank attacks and envelopment seek to engage the enemy in his current position. 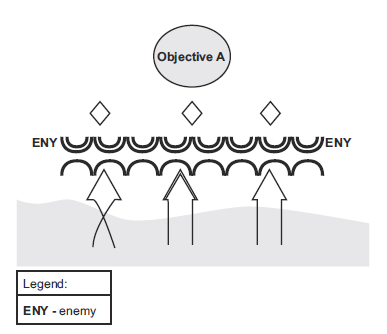 Exposed enemy flanks may be created by the attacker using fires or by a successful penetration. 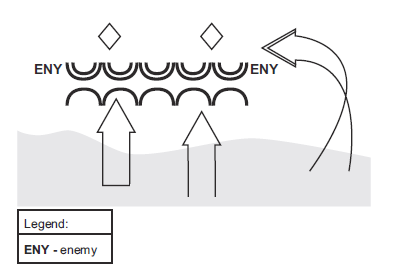 Flanking attacks are normally conducted by supporting efforts that fix the enemy's front while the friendly main effort attacks the enemy's flank. Due to their simplicity, flank attacks often serve as the form of maneuver favored by hasty attacks or immediate action drills during which speed and simplicity are paramount to maintaining battle tempo and, ultimately, the initiative. An envelopment is a form of maneuver in which an attacking force seeks to avoid the principal enemy defenses by seizing objectives to the enemy's rear or flanks in order to destroy him in his current position. A successful envelopment requires discovery or creation of assailable flank. The envelopment the preferred form of maneuver because the attacking force tends to suffer fewer casualties while having the most opportunities to destroy the enemy. Envelopment focus on seizing key terrain, destroying specific enemy forces, and interdicting enemy withdrawal routes. A turning movement is a form of maneuver in which the attacking seeks to avoid the enemy's principal defensive positions by seizing objectives to the enemy's rear. This tactic causes enemy forces to move out of their current positions (as opposed to flank attacks and envelopment, during which friendly forces seek to engage the enemy in his current location). For a turning movement to be successful, the unit trying to turn the enemy must attack something that the enemy will fight to save, such as a supply route, artillery placement, or a headquarters. In addition to attacking such a target, the attacking unit should be strong enough to pose a real threat to the enemy. 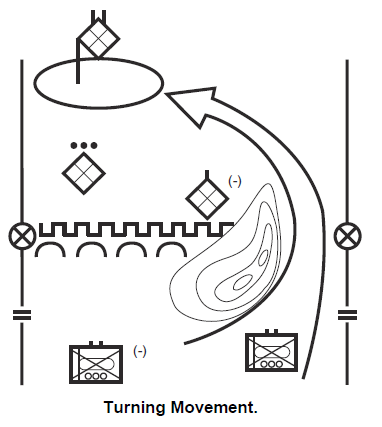 The turning movement is a type of envelopment in which the attacker attempts to avoid the defense entirely. Instead, attackers seek to secure key terrain deep in the enemy's rear and along their LOCs line of communications. Faced with a major threat to their rear, the enemy is "turned" out of their defensive positions and forced to attack rearward. An infiltration is a form of maneuver in which an attacking force conducts undetected movement through or into an area occupied by the enemy forces to occupy a position of advantage in the enemy's rear while exposing only small elements to enemy defensive fires. Moving and assembling forces covertly through enemy positions take a considerable amount of time. A successful infiltration reaches the enemy's rear without fighting though prepared positions. Attack an enemy held position from an unsuspected direction. Occupy a SBF position to support an attack. Conduct a covert breach of an obstacle. Penetration is a form of maneuver in which an attacking force seeks to rupture enemy defensives on a narrow front to create both assailable flanks and access to the enemy's rear. Penetration occurs when enemy forces are overextended, when weak spots in the enemy defense are identified, and when time does not permit some other form of maneuver. As part of larger force penetration, the unit will normally isolate, suppress, fix, or destroy enemy forces; breach tactical or protective obstacles in the enemy's main defense; secure the shoulders of the penetration; or seize key terrain. Breach the enemy's main defenseive positions. Widen the gap created to secure flanks by enveloping one or both of the newly exposed flanks. 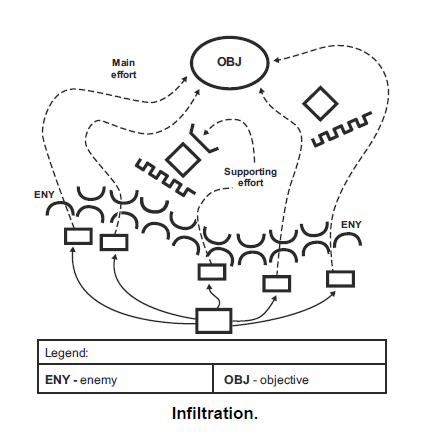 Generally, planning and execution an attack or other offensive action occur in five phases,preparatory, conduct, consolidation and reorganization, exploitation, and pursit. While the actual element within each phase might differ regarding the nature of the offensive action, the phases remain valid. During preparatory phase, commanders completes planning, intelignece, and reconnaissance effort. Offensive actions planning needs to incoporte nonlethal operations that may prove necessary throughout the operation due to the presence of civilians on the battlefield. Commanders conduct preliminary operations, such as orientation, rehearsals, and movement and concentration forward in the AA. If planned, execution of deception operations, such as feints or demonstrations, occur while shaping or preparatory fires commence. Assessment and refinement of all these actions are continuous. Finally, since movement toward or in close proximity of the enemy occurs during this phase, the company commander mitigates security risk through assessing the likelihood of contact. The conduct of an attack involves three separate stages, all of which focus on successfully placing the main effort at the decisive point. Assembly Area to the Attack Position. The unit departs from the AA per commander's plan. Departure may be simultaneous or staggered. Elements may move together toward the attack position (the last covered and concealed position prior to the line of departure) or depart of varied routes. Preparatory fires and other shaping actions may commence. Line of Departure to the Assault Position. If not underway, the FST Fire Support Team begins to execute the fire support plan to cover the movement of various elements. Supporting efforts beings their missions. The main effort moves when indicated to the assault position (the last covered and concealed position before the objective) where it deploys into assault formations and conduct final coordination.